If yall are anything like me you have a craft stash? My husband went hunting this weekend and I pulled together a bunch of odds and ends to make 3 very cute garlands. They make the house more festive I even took one to work…. Don’t worry don’t have a lot of this at home? If not most of this can be bought at the dollar store for very very cheap. 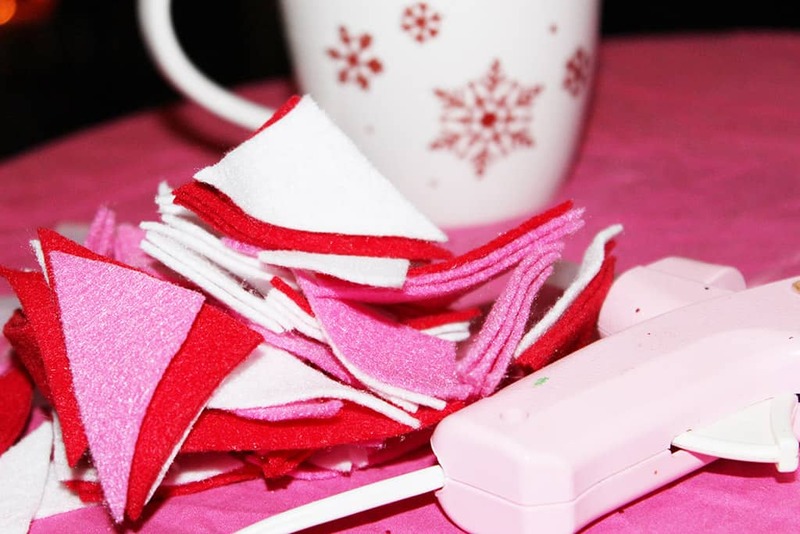 When it comes to crafting & cooking I always try to do Pretty, Cheap and easy ! All of these were so simple and creating with my glue gun. For the felt garland I cut a lot of triangles at one time they don’t have to be perfect. 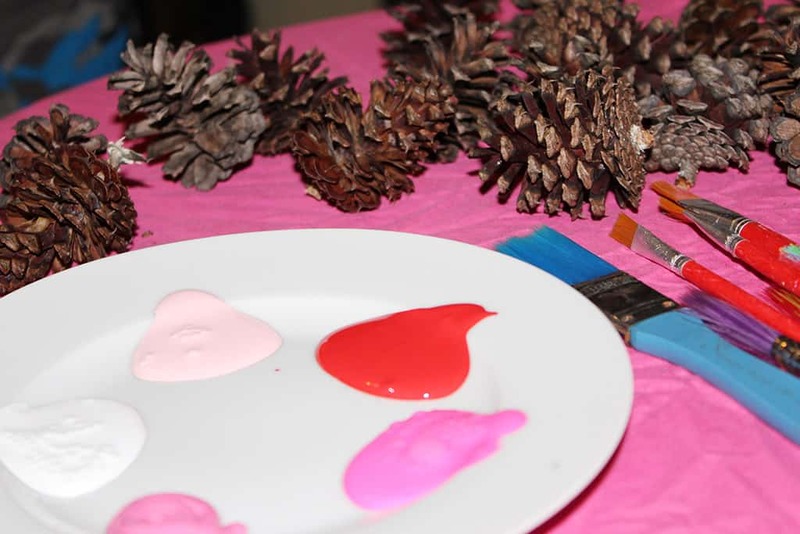 I painted just the tips of the pine cones with a regular paint brush different shades of pink. Hot glued the tops on the pine cone directly onto string. 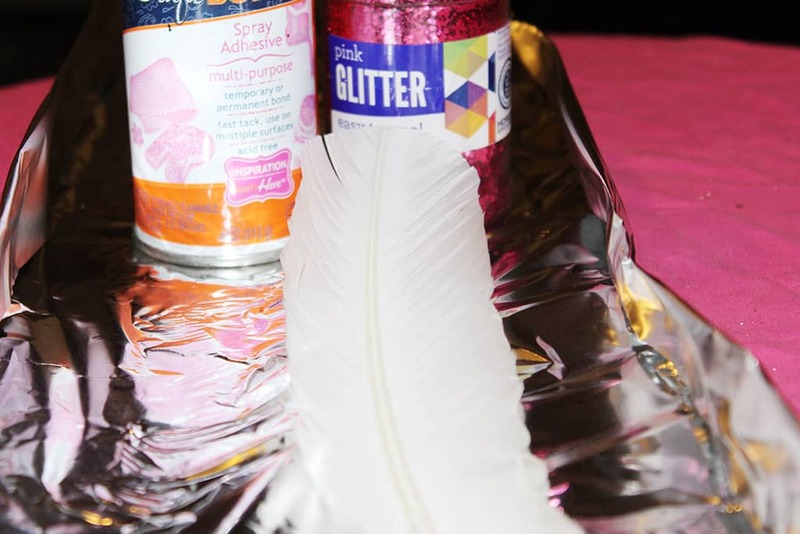 The spray glue is very powerful so I placed the feathers in tin-foil to spray them and then added the glitter so it wouldn’t go everywhere. 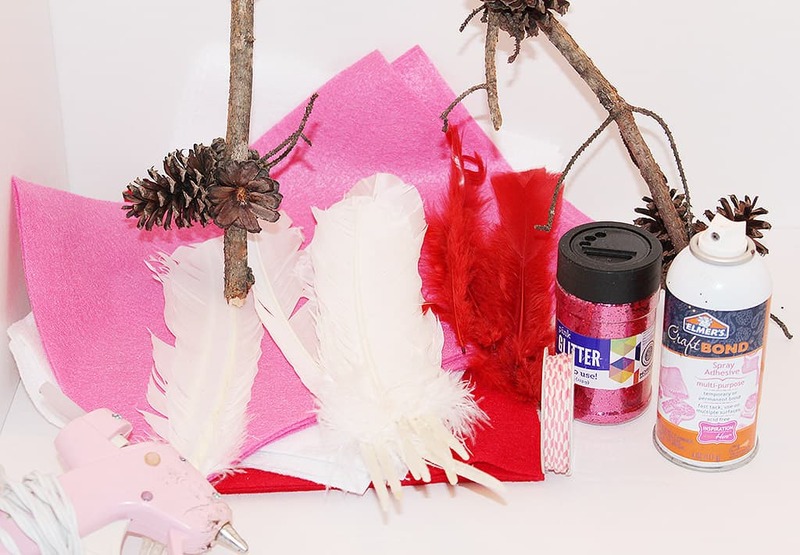 Put tiny holes in the feather stems to string them on. I glued the felt triangles together back to back with the glue directly on the string. This was so fun and easy anyone can do this do not be intimidated !! Thanks so much for coming by !!! It’s means so much Happy Valentine’s Day !! That is cute and so different from most Valentine's day things I have seen! This is so fun and festive! The pinecones are a perfect touch! I LOVE the pine cone garland! Once we move this weekend, making one of those would make for a great crafting session with my toddlers! Girl, you always are so creative!!! OMG, these are so cute! I never thought of pinecones for Valentines Day, very unique! Oh my gosh ! I love this it's seriously the cutest idea ever. I'm gonna have to see if hubby is up for it. Lol! That's too cute! I hope you and the kiddo's have a great valentine's day. Very creative! I have a box of pine cones hanging out in my garage. This would be a perfect use for them. Love the feathers. I'm the least crafty person out there but I feel like I could handle this! 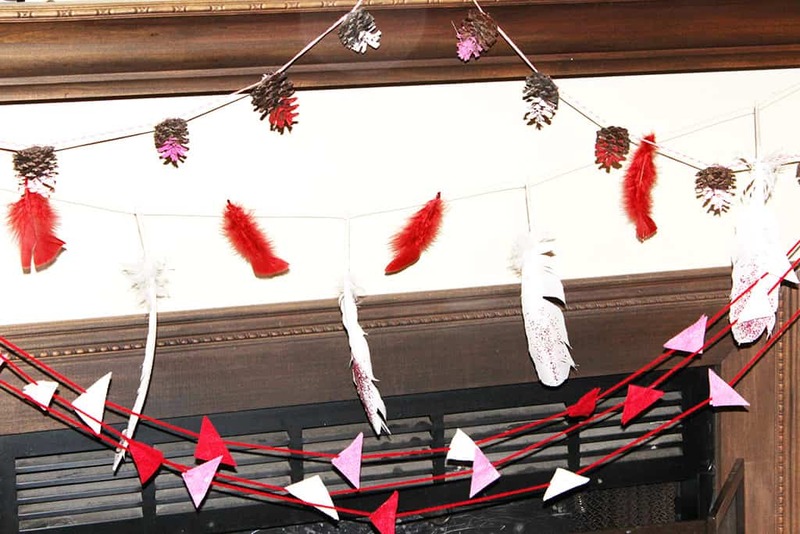 How super cute did this garland turn out?! 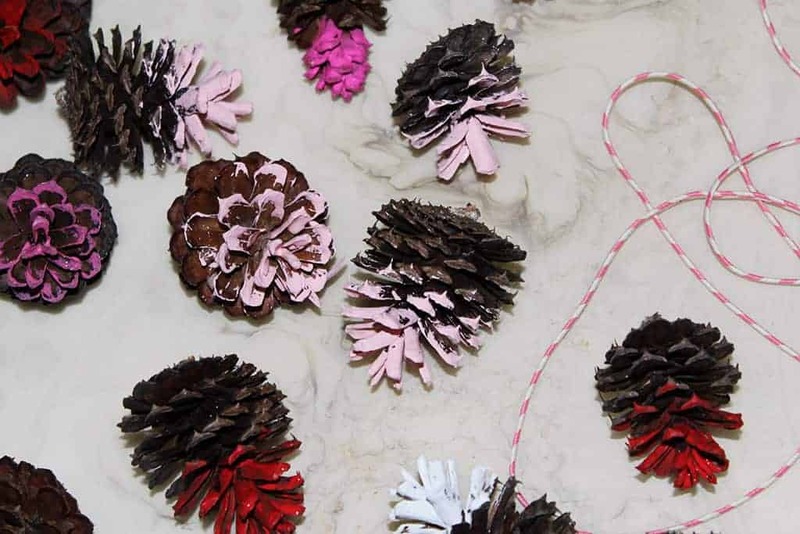 I love the idea of decorating with pinecones, so this is a must! Thank you for sharing this great diy! So fun and festive! This motivated me to decorate for Vday! I usually think of pinecones for Christmas but this is really cute! I love these ideas. It can be made easily with kids too, maybe my five would enjoy them too. How pretty! I never really decorate for Valentine's Day but these are so cute I might have to try them. Thanks for sharing! So cute! I never really decorate for Valentine's Day, but I should! I love this and far cuter than anything I bought! My boys would enjoy this, so kid friendly! Great ideas for kids and adults. Those are so cute! I love the idea of using pine cones, it's so unique! Really cute, simple way to make the room a little more festive! Awww I love this!!! So cute! So cute! 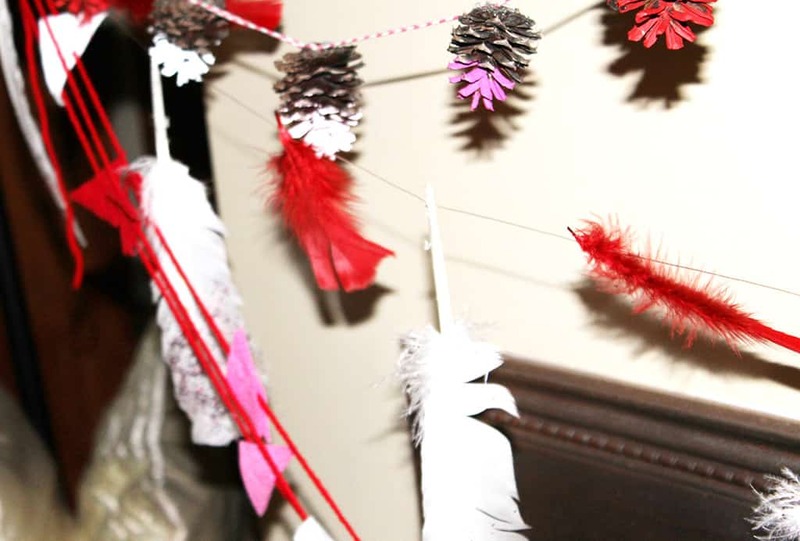 I would definitely use that pinecone garland if I was hosting a valentine's party. It's adorable. These are cute - I think my favorite is the one with pinecones! Adorable! 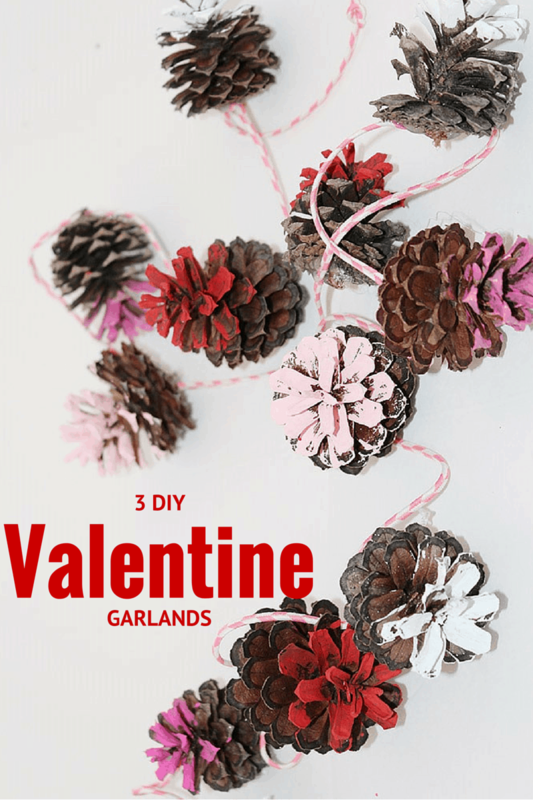 I love the pine cone garland! Love all of these. They look so easy to do. The pine cone one is my favorite. How fun! The pine ones are my fave!!! I lI've the pine cone garland. I would have never thought of that for a Valentine's Day decoration. Super cute! I like pretty, cheap, and easy too!! 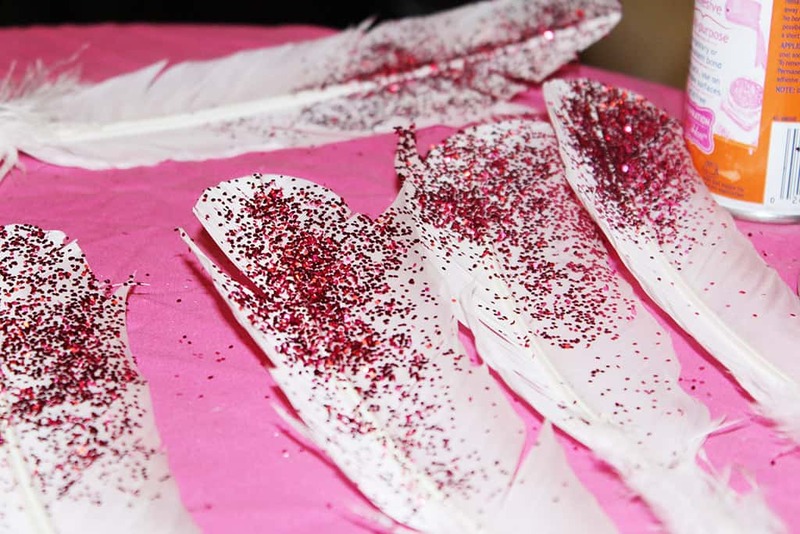 I love the glitter on the feathers, but I really love the look of all three together! And I have got tons of felt still so something like that felt garland would be perfect for me! This is so cute! 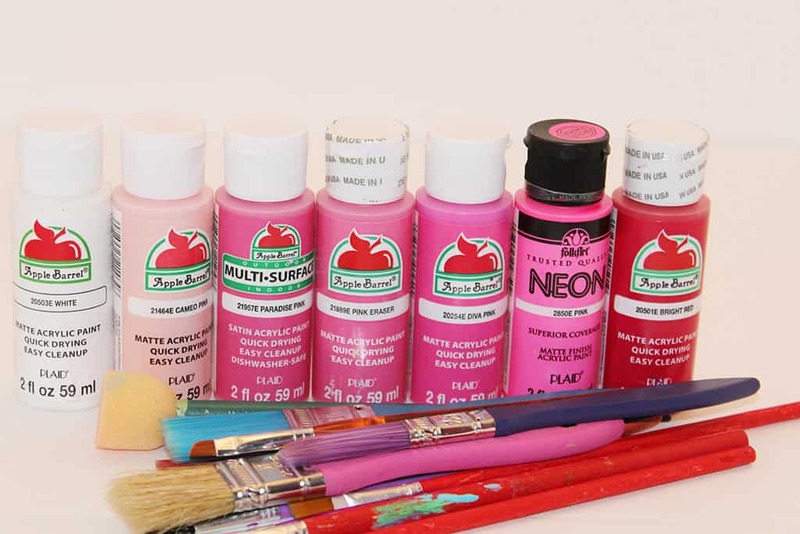 And seems perfect for people who are craft-challenged, like me!